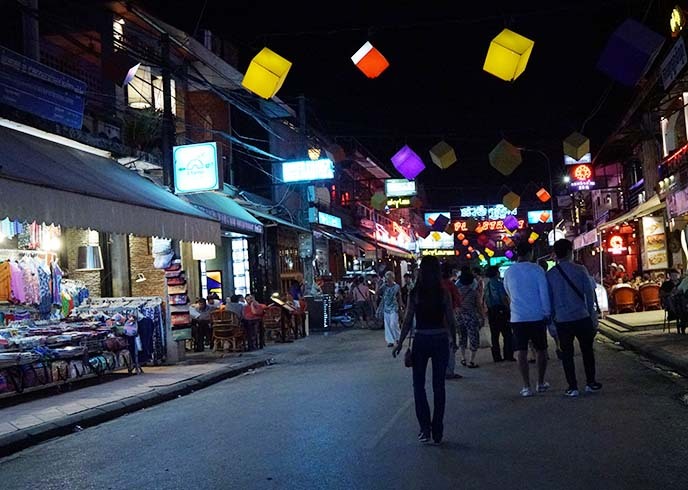 Siem Reap Pub Street: Nightlife & Restaurants! Miss Wong cocktail bar, Phare the Cambodian circus. Cambodia was one of the most inspiring countries I’ve visited. 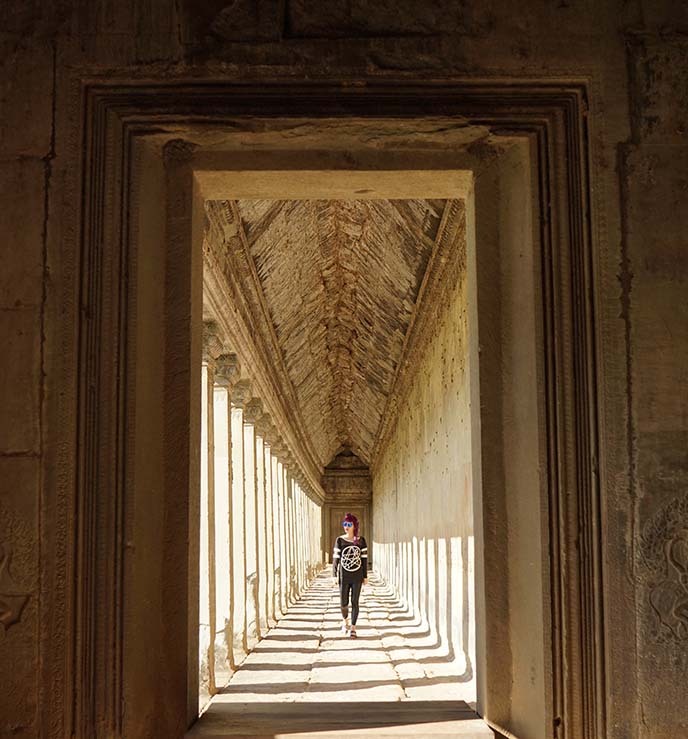 I’ve long been fascinated by Angkor Wat — and the mysterious temple more than lived up to my expectations. 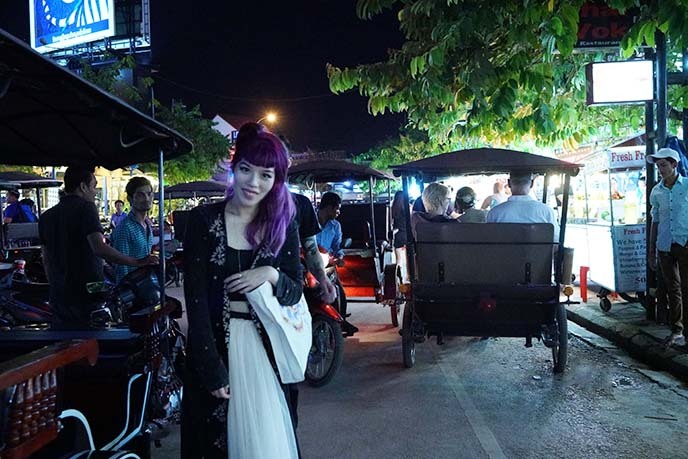 You also must stop by my favorite craft cocktail bar, innovative restaurant and Phare, the Cambodian circus… read on to find out why! 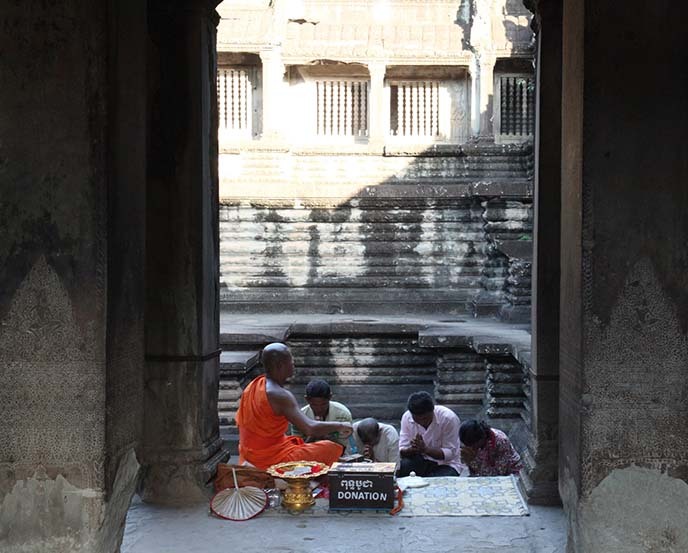 After the sun rises, many tourists go on to explore the main buildings of Angkor Wat. However, to avoid the crush, I recommend seeing other temples in the morning and early afternoon — and coming back later, when it’s less busy. Angkor Wat’s lighting conditions are also better in the afternoon. You can capture dramatic light and shadow-play such as above (in this long hallway that feels like an infinite portal). 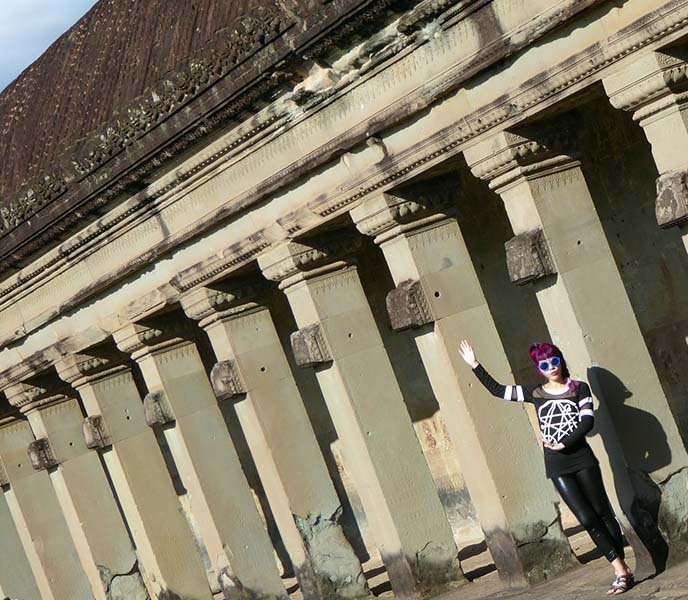 We loved incorporating the ancient architecture of Angkor Wat into our photography. This image is by Ken Yuen, who didn’t realize until too late that Sniper Chau was in the frame! 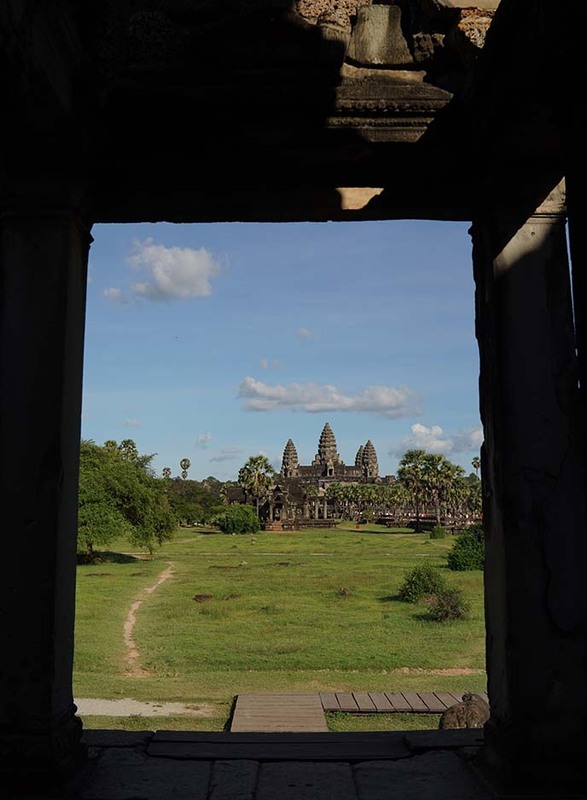 Angkor Wat is one of the world’s most mysterious archaeological sites. 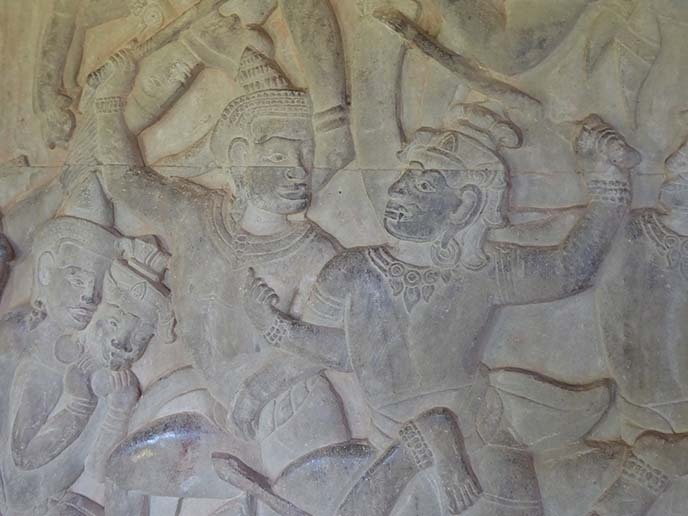 There were rumors of a great Khmer stone city, but the West was unaware of its existence until the late 19th century. 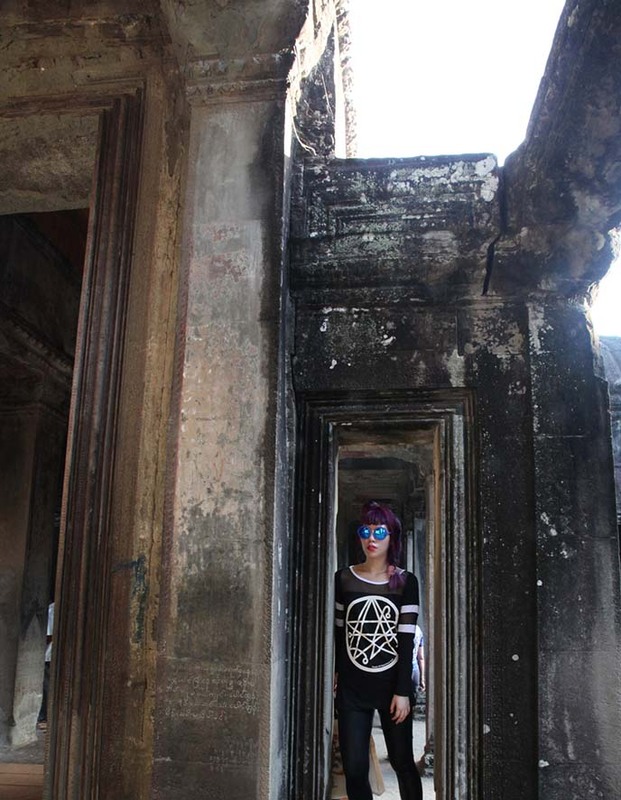 In an ancient, mysterous lost city, it seemed right to wear clothing inspired by HP Lovecraft’s mythos. I’m wearing this exact Disturbia Dead Moon Rising top — they also make a Necronomicon top. Can you imagine how French explorer Henri Mouhot must have felt in 1860, when he stumbled upon this view? 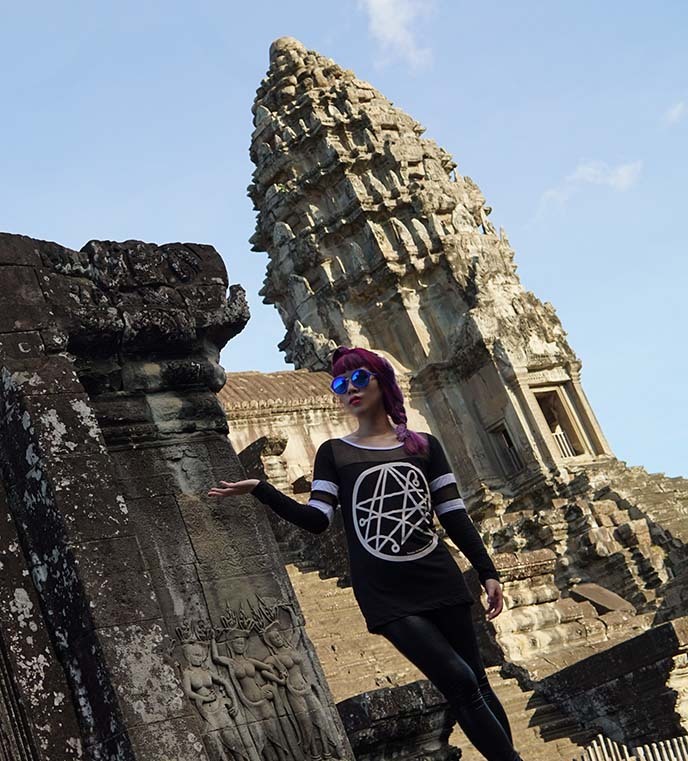 There are over a thousand temples here, filled with images from Hindu mythology and Cambodian legends. The unusual architecture made my imagination run wild. I imagined that this thin, rectangular door was a portal into an alien universe. Inside the central sanctuary, we saw a monk offering blessings to visitors. The 12th century temple design reflects Hindu conceptions of the universe. We were glad to have our guide (provided by Le Meridien Hotel) with us, to answer questions about this fascinating place. Visitors are free to climb and explore most of the temples. I went up this stepped terrace in the main Angkor Wat hall. We walked down the long covered galleries, which were decorated with exquisite bas-reliefs. Most of these carvings depict the Hindu epic tales, Ramayana and Mahabharata. Our guide also pointed out depictions of hell tortures, elephant warriors, martial artists, and much more. An outside view of one of the long galleries, which surrounds the central sanctuary. My pose was inspired by the carvings of apsaras (celestial dancers). 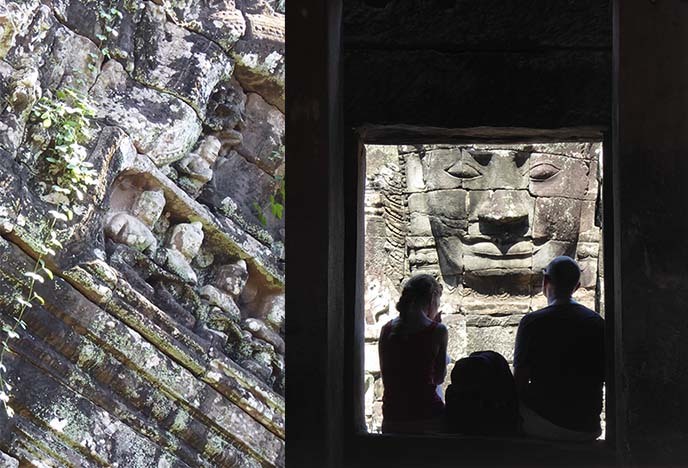 Of course, there is much more to see at Angkor Wat. 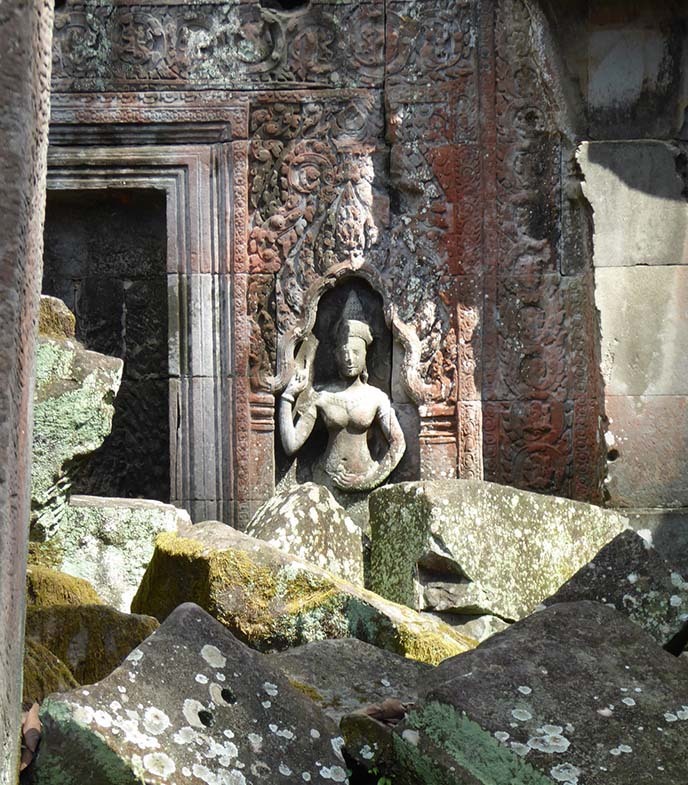 We wished we had more time to see the outer-lying temples, such as Banteay Srei (dedicated to the god Shiva). On the way to an elephant gate topped by a Buddha, we saw this row of Buddha and demon statues. Some had been restored, hence the different conditions of the faces. In the previous post, I showed you the famous “tree roots Tomb Raider” temple, Ta Prohm. 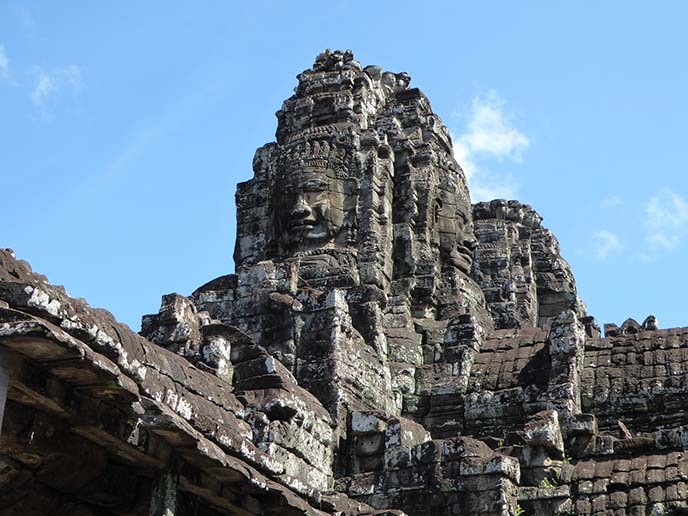 We also stopped by Bayon, the richly decorated structure that is famous for its serene, smiling rock faces. 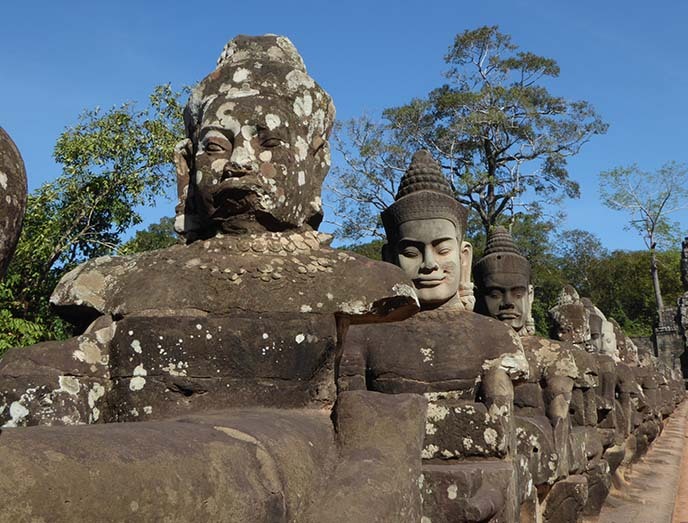 These depict the Buddha, or King Jayavarman VII — or perhaps both. Similar to the temples in Bali, there is a lot of flow between Buddhism and Hinduism. Angkor Wat was originally dedicated to Hindu god Vishnu, but later became a Buddhist holy ground. 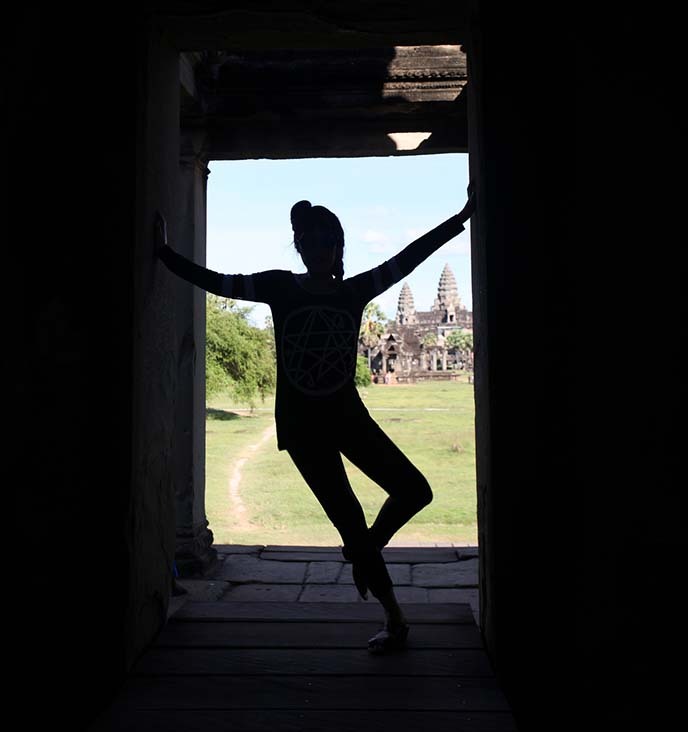 An ancient civilization, hiding in the jungle… Angkor Wat truly captured my imagination. A closeup of my Disturbia UK long sleeve shirt with mesh cut outs. The symbol is the Necronomicon gate symbol, from the Lovecraft mythology. 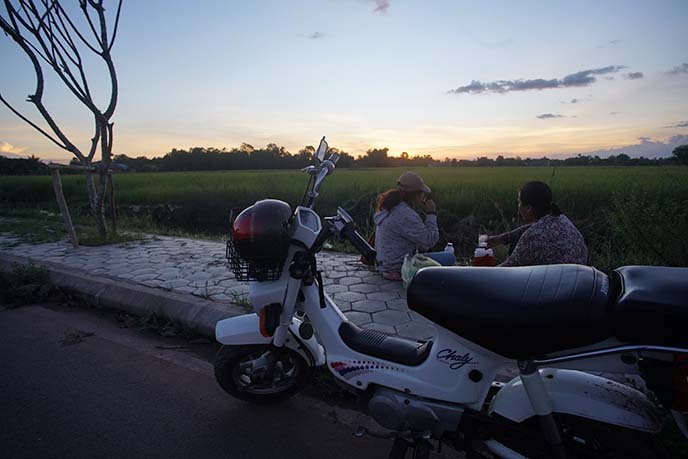 There’s more to see in Siem Reap, Cambodia than the legendary temple. At night, the city center comes alive with night markets, street food and bars. We crossed this bridge, lit up with X-lights, and John found a stuffed crocodile to take home. 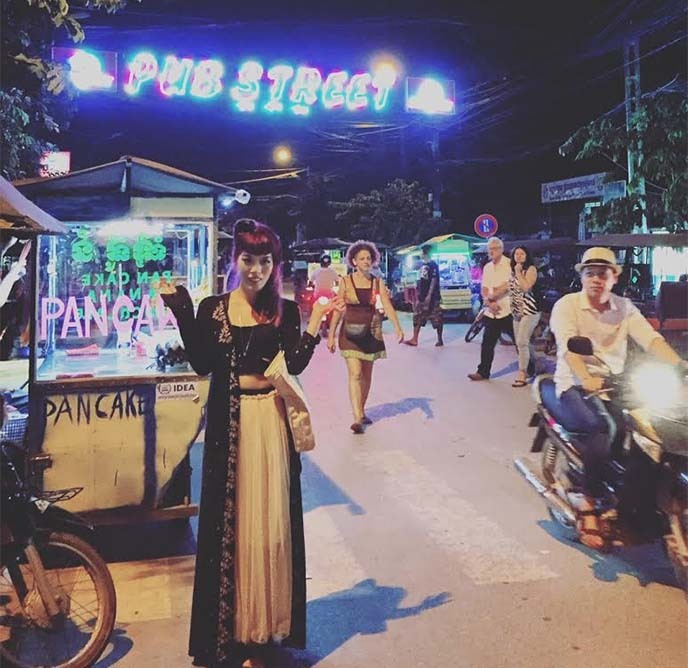 Pub Street is the center of the nightlife (including the Angkor What? pub that you saw above). 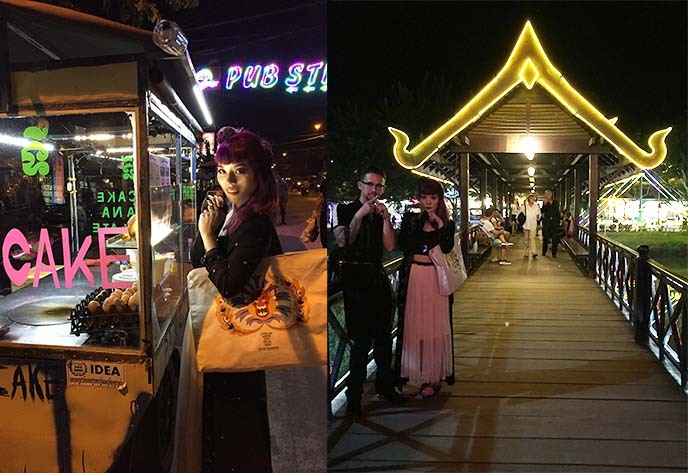 It’s a cacophony of tuk tuks, partiers and bars, many of which are geared towards foreigners. Pub Street was fun to walk through, but these tourist-oriented bars and shops aren’t our type of scene. Fortunately, we found a place where we felt we belonged: Miss Wong. 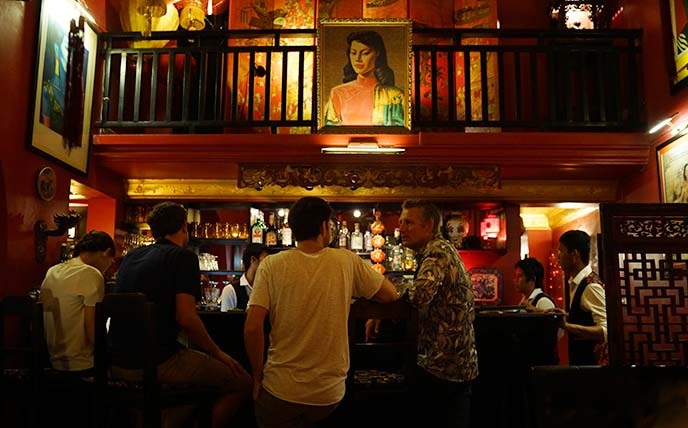 This retro Shanghai-themed bar is located a little off the main roads, tucked away from the crowds. Look for these glowing red lanterns at the entrance. 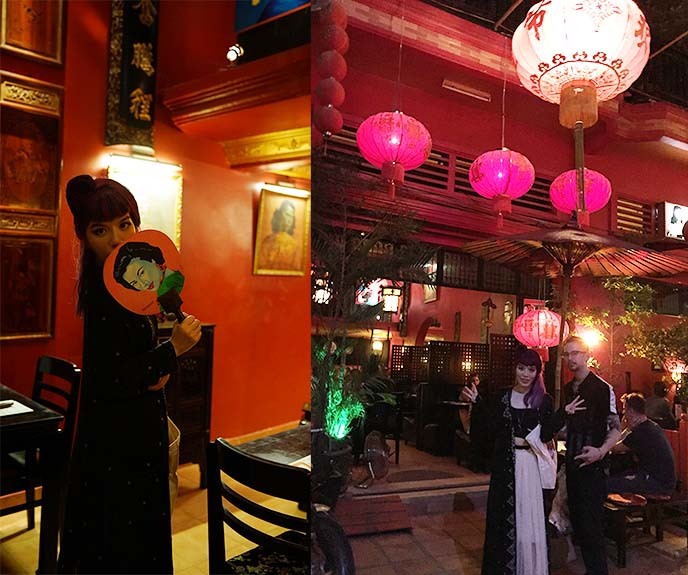 Inside, the decor is ravishing: elegant red walls and vintage Chinese art. Dean (the owner who is originally from New Zealand) gave us the warmest welcome. We could sense that he runs Miss Wong with passion, always taking the time to make his visitors feel at home. Miss Wong is known as the best cocktail bar in Siem Reap. 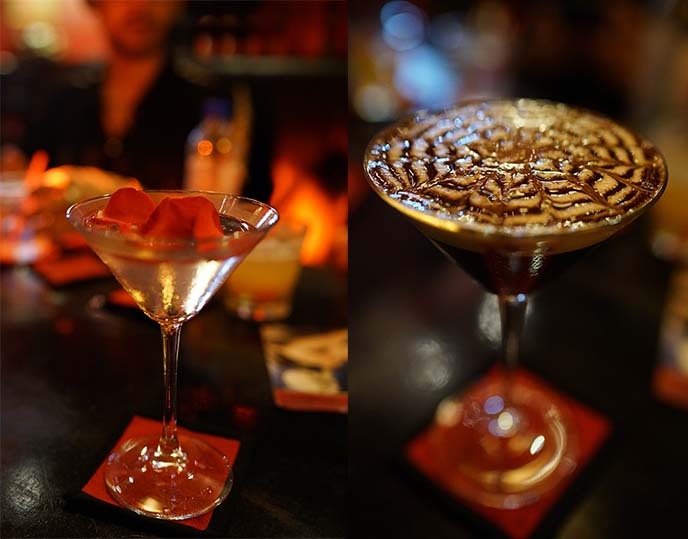 It deserves this accolade: the rose petal and mocha martinis were as amazing as they sound, and look. 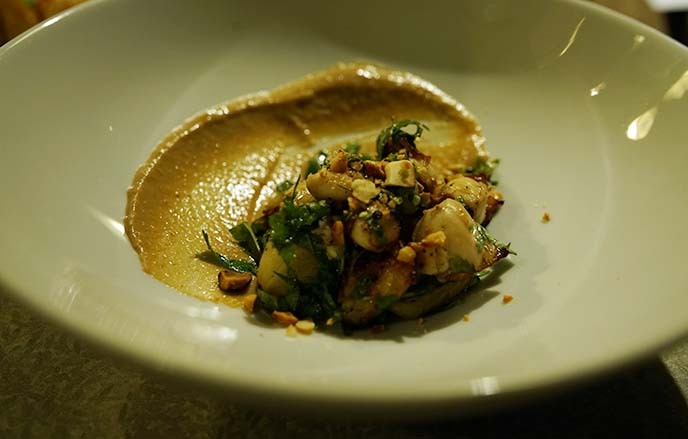 We were impressed by how Miss Wong infuses spirits with Asian flavors. The Lemongrass Collins, made from vodka heated with fresh lemongrass, was one of the best drinks I’ve had all year. We were also wowed by the black pepper infused vodka, delightful on its own or as a Bloody Mary. Miss Wong also serves Chinese dim sum bites, and has a top selection of liqueurs from around the world. 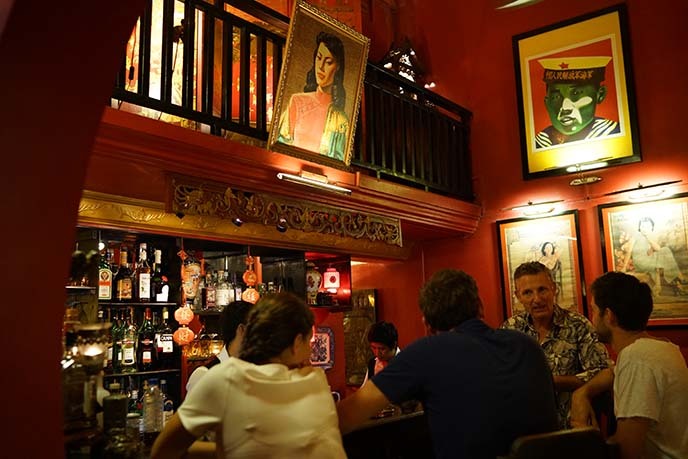 If you’re all about handcrafted cocktails and a classic, relaxing atmosphere, Miss Wong Siem Reap is a gem. You can’t miss out on this bar; tell Dean that we sent you, when you visit! 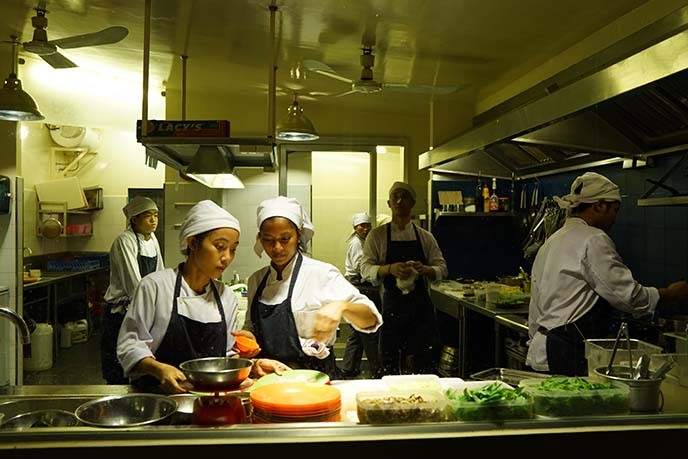 We had a wonderful set-menu dinner at Cuisine Wat Damnak, a restaurant that merges Cambodian flavors with French culinary techniques. It is on my cousin’s list of top 50 restaurants in Asia (we are trying to go to each one). The open kitchen and lush dining area set the mood for this special meal. Chef Joannès Rivière changes his six-course menu every week, focusing on seasonal ingredients sourced from local farms and foragers. 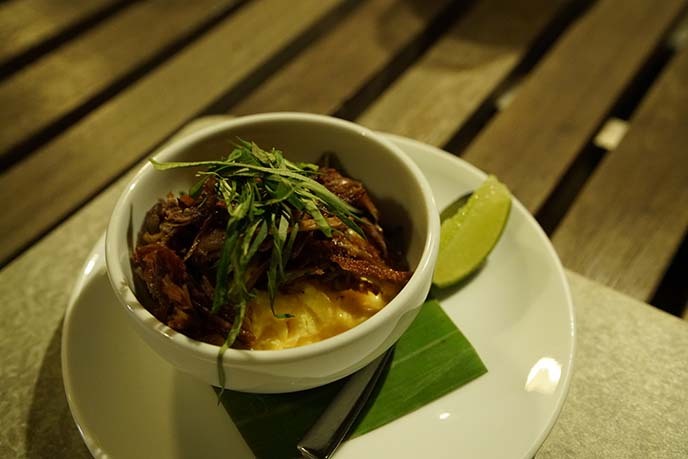 The unusual ingredients and creative preparations — like frog legs with Cambodian spices — were magnificent. 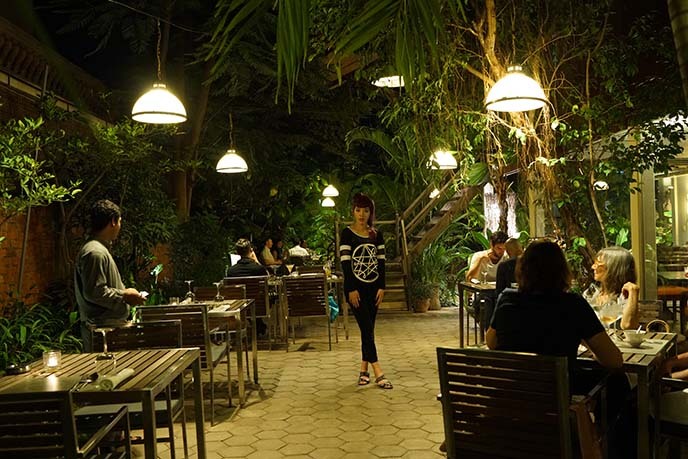 The chef does an outstanding job of balancing modern and traditional, French and Khmer. Six sophisticated plates for under $30 US — only in Cambodia! Be sure to make a reservation in advance for Cuisine Wat Damnak, since this restaurant is often booked up. 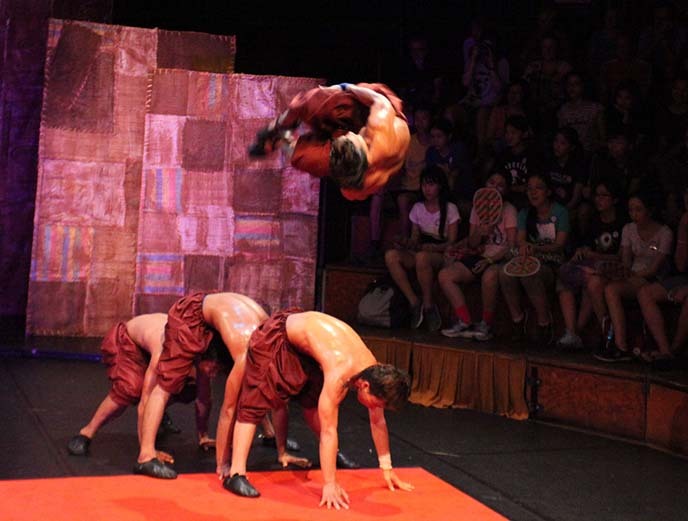 Finally, you can’t leave Siem Reap without seeing the Phare, the Cambodian Circus. Inside a big top, we saw young Cambodian performers tumble, leap, juggle, balance, dance and clown — while wearing the biggest smiles on their faces. 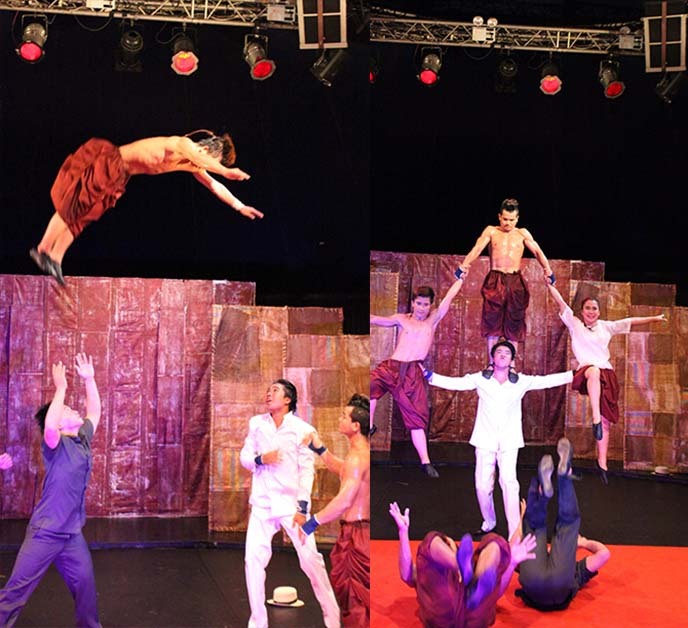 The show drew upon Cambodian folk storytelling, and pushed it forward with avantgarde antics and sky-high acrobatics. We watched these young performers tell a narrative that took us from primordial times to colonial conquest and beyond. 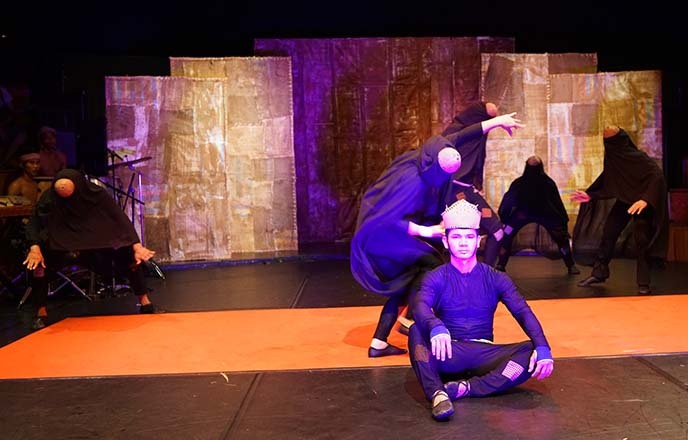 Phare is more than just entertainment: it has the social mission of educating Cambodian youth (through their NGO school), helping them find employment, and furthering the Cambodian arts. The crowd could sense the passion and determination of the young artists, who all overcame difficult socio-economic backgrounds. 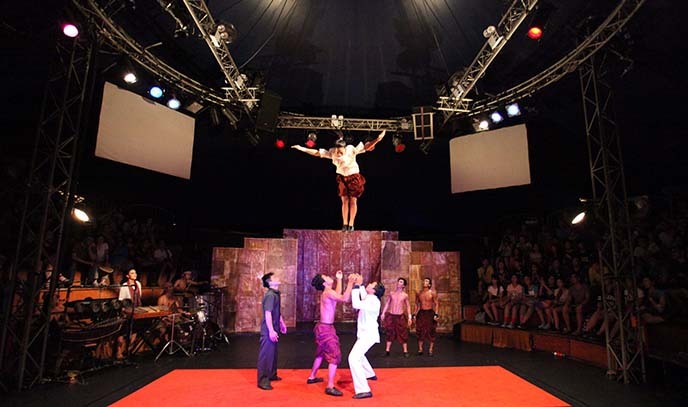 Phare, the Cambodian Circus has performances daily; you can find out more on their site. We loved watching these young talents, especially knowing that it was in support of Phare’s meaningful programs. Cheers to Cambodia! 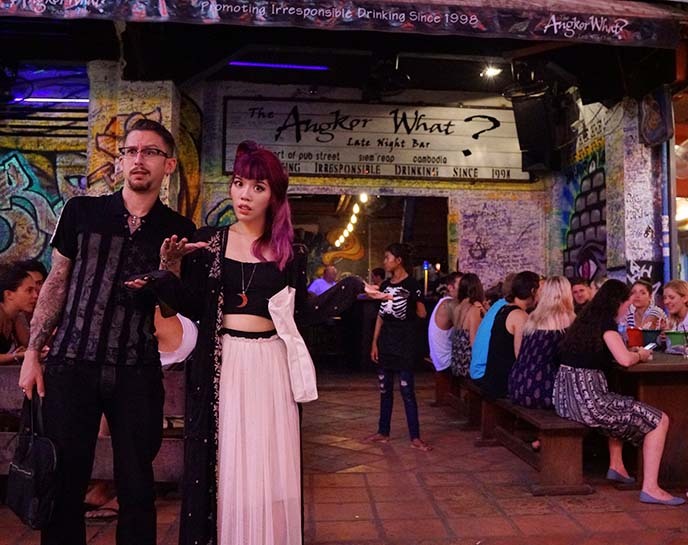 From Angkor Wat to the bars, restaurants and circus, I had a blast here. Thanks to HK Express for the easy direct flights from Hong Kong to Siem Reap, and to Le Meridien Angkor Hotel for the magnificent stay. 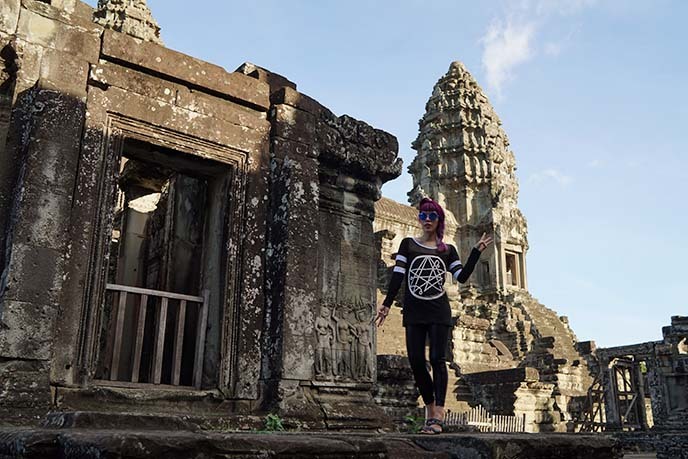 Are you as fascinated by the “Tomb Raider” temples as I am? Coming up soon — I’ll unveil the photoshoot we did amidst the archaeological ruins! WOW! how beautiful is Angkor Wat! Love that place! Went there oh about 15 years ago, magic. I went to the Lovecraft bar NYC, photos soon! Beautiful pictures and description! 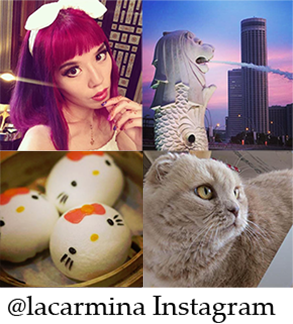 I love traveling vicariously through your blogs! Thanks for visiting us in #siemreap! Hope we see you again soon. 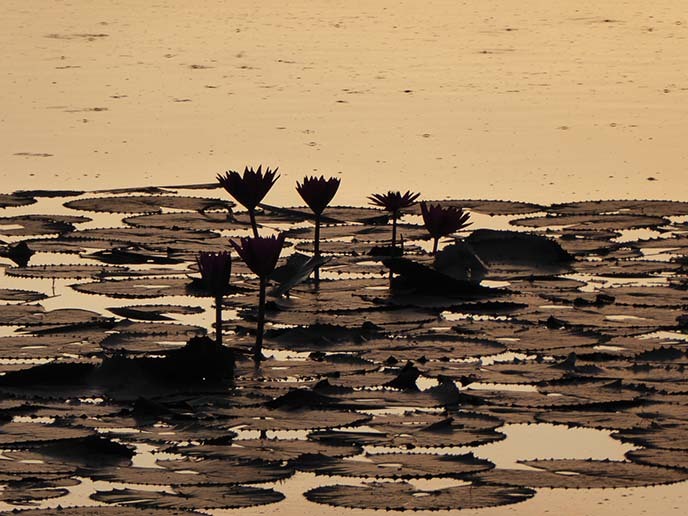 Looking forward to reading more about your trip to #cambodia. 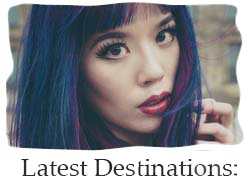 Hey… @lacarmina. I love you, girl! Success! 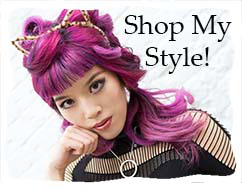 Did you just get that shirt, or Are you into Magick, occult, alchemy, and esotericism? I don’t identify with/associate myself with any group, but am always intrigued by history, culture, spirituality. And I do love the works of Lovecraft ! This looks amazing! Can’t wait to go! GREAT job! <3 can't wait to see you soon!